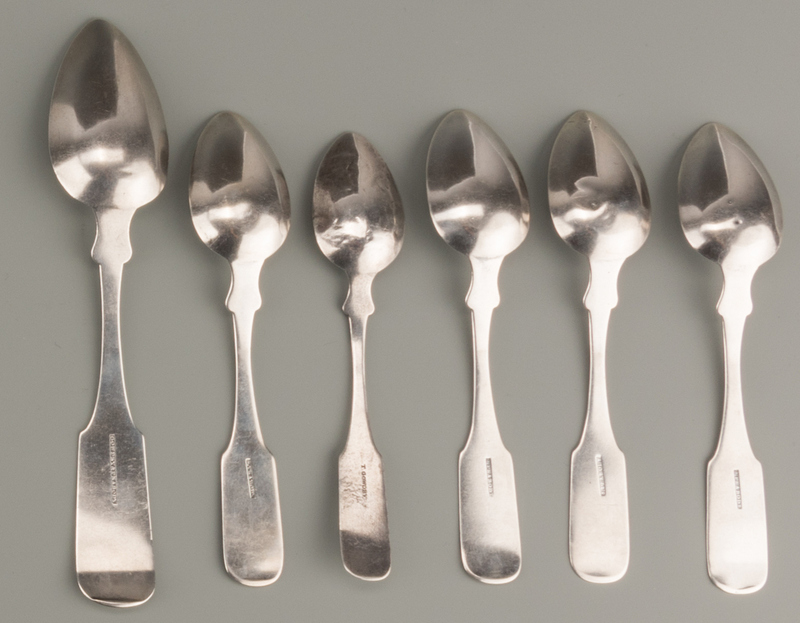 19 pieces Nashville coin silver and sterling flatware. 1st group (6 pcs) : 1 dessert spoon with fiddle pattern handle marked Gowdey & Peabody in rectangle, no monogram; 4 Fiddle pattern teaspoons marked J. Peabody in rectangle, monogrammed M, and 1 fiddle pattern small tea or coffee spoon with incuse mark T. Gowdey (Thomas Gowdy, retailer/jeweler working Nashville, 1825-d. 1863), monogram KD. 2nd group (13 pcs) : 2 teaspoons with fiddle tipt handles, marked W. H. Calhoun Nashville T. in rectangles (William H. Calhoun, Nashville, Tennessee, working 1839-1865), monogram B; 1 tablespoon with fiddle tipt handle with incuse mark W. H. Calhoun Nashville, monogrammed McG; 3 fiddle pattern teaspoons with marks for S. Musgrove (Samuel Musgrove, working Nashville, 1853-1860), 2 marked on back in rectangles and monogrammed FB, the other with incuse mark; 2 tablespoons with beaded edges – 1 with incuse mark W.H. 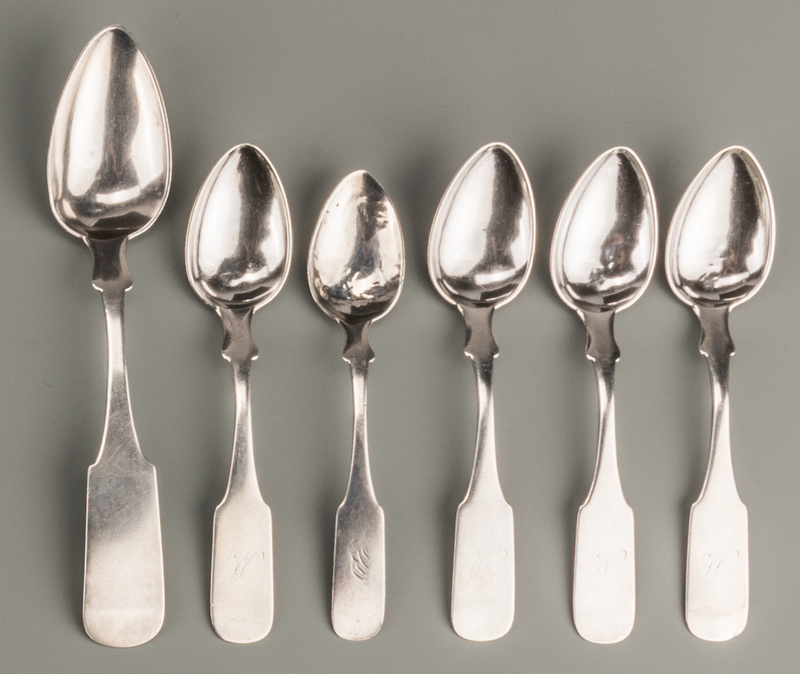 Calhoun, monogrammed AMH, the other with incuse mark T. Gowdy, monogrammed Egan; and 4 teaspoons and 1 knife with Aesthetic Movement style engraved handles, marked W & H Sterling and wtih retailer mark E. Wiggers (Ernest Wiggers, working Nashville, circa 1866). Total weight for all 19 pieces: 14.99 oz troy. CONDITION: 1st group: Minor wear and some denting to bowls of the Calhoun spoons. 2nd group: Several spoons have some small dents to bowl, especially the Gowdey spoon. Overall good condition.